Today’s city has a dramatically accelerated pace and rhythm in motion, which requires a greatly improved transportation and logistics service. Many solutions of Internet of Things (IoT) have been proposed to develop the urban mobility and meet the requirements in transportation and logistics from the point of view of smart cities. As IoT has our urban space connected everywhere, it enables us to gain real-time transportation information and to monitor the status of the transported goods. In transportation, IoT may integrate the camera-based traffic monitoring systems, the low-power widespread communication, the GPS installed in vehicle, and even the combination of air quality and acoustic sensors along a given road together. It provides us the complete and appropriate real-time information that is invaluable for vehicle drivers, traffic controllers, and automatic vehicles to schedule a better route or plan in advance to fulfill the transportation goal. In logistics, IoT may use RFID- and NFC-based technology to provide broad real-time information ranging from design in commodity, purchasing of raw material, production, transportation, storage of semi-products and products, distribution and sale of products, processing of returns, and even after-sales service, helping supply chains to respond to intricate and changeable markets in the shortest time. Thriving examples, whether by air, ground or sea, can be found corresponding to the attempts of using IoT to improve motion of cities. Along with the flourish IoT technology in transportation and logistics, cities are blanked by more layers of networks containing digital information in motion. Huge amount of real-time data are generated. Yes, information in real time is a “power”, and it should has a value in improving the motion of city. However, how to use the “power” effectively and productively, rather than to generate then waste it mostly? The answer has to rely on the development of smart technology of IoT. Smart IoT of transportation and logistics unleashes the real value of IoT in improving motion of cities with efficiency and productivity. Smart IoT has shown its capability of addressing traffic congestion, safety, pollution, and the efficiency of goods transportation and delivering. As an example, the smart traffic signal control system  (the Internet of smart intersections) displayed an impact on transportation with increased average vehicle speed by 34%, decreased average travel times by over 25%, and reduced overall emissions by 21%, with its core smart control algorithm associated with the transportation information obtained from IoT technology. Another example is the smart rail system which ensures the on-time operations of the high-speed rail line between Madrid and Barcelona. Smart IoT enabled railway companies predict when breakdowns might occur and fix those trains proactively, resulting in nearly flawless service: with only one major delay in 2,300 trips, nearly 100% availability of operational trains . The smart route choice system associated IoT information can figure out better real-time routes and has proved its very beneficial service to drivers . The slot-based smart intersections control system has provided a performance breakthrough, where traffic efficiency is doubled with respect to current state-of-the-art traffic lights, while all safety requirements being equal . 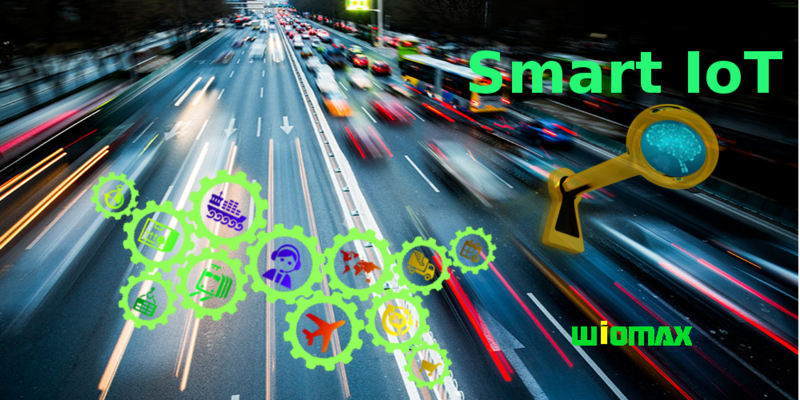 More examples using smart IoT have emerged in large numbers with the other applications in transportation of logistics within recent years, such as smart parking systems, smart roadside assistance, autonomous and connected vehicles, etc. The scientists, engineers, entrepreneurs and stakeholders who develop smart IoT technologies and businesses need to think much more beyond providing one of the increasingly numerous gadgets that connect everywhere. The efforts of inventing and expanding the smart IoT applications in transportation and logistics should produce new values and would assure us a better mobility of city for now as well as many years in coming. Xiao-Feng Xie, et al. Smart and Scalable Urban Signal Networks: Methods and Systems for Adaptive Traffic Signal Control. U.S. Patent, No. 9,159,229, 2015. Gerhard Kress, Bruce Posner. Internet of Things in Motion: Analytics and Transportation. MIT Sloan Management Review, May 25, 2016. X.-F. Xie, Y. Feng, S. Smith, K. L. Head. Unified route choice framework: Specification and application to urban traffic control. Transportation Research Record: Journal of the Transportation Research Board, 2014, 2466: 105-113. R. Tachet, P. Santi, S. Sobolevsky, L. Reyes-Castro, E. Frazzoli, D. Helbing, C. Ratti. Revisiting street intersections using slot-based systems, PloS ONE, 2016, 11(3), e0149607. Blog helps me a lot to grasp many points about IoT in Transportation and Logistics. Keep sharing more and more articles like this.